The GBPAUD ran into its resistance area which is visible in light grey in the above H4 chart and was unable to breakout above it. This has resulted in a reversal and this currency pair is now approaching a possible breakdown below this level from where sellers can take the GBPAUD down to its support area which is visible in light blue. The Bollinger Band indicator shows a divergence which could result in an increase in volatility. The upper Bollinger Band as well as the middle Bollinger Band are currently supporting the previous advance while the lower Bollinger Band has diverged and is now supporting a contraction in price action. 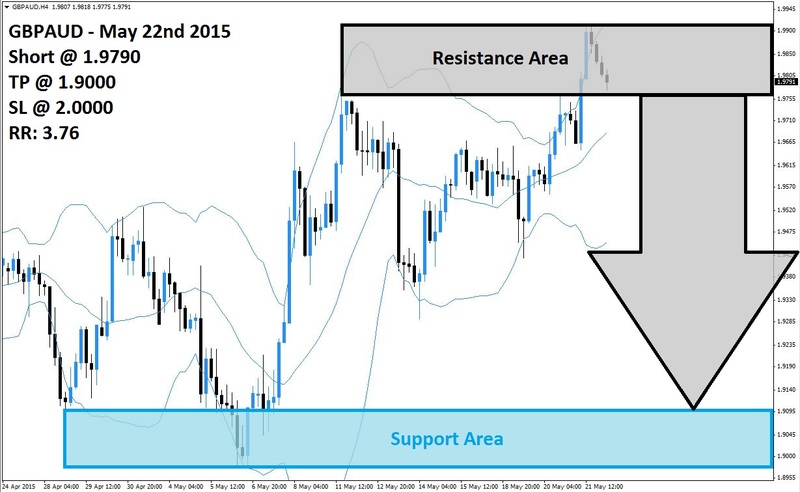 A breakdown of the GBPAUD below its middle Bollinger Band, which is currently positioned below its resistance area, is likely to result in a momentum shift. Forex traders may decide to realize floating trading profits after a strong rally and exit their long positions which will further drive down this currency pair. Forex traders are recommended to enter short positions at 1.9790 and above in order to position their forex portfolios for the expected breakdown below its resistance area and following sell-off. The GBPAUD is trading between the middle band and the upper band of its Bollinger Band Indicator, but price action is likely to shift into a range between its middle band and its lower band. This expected shift is likely to result in a sharp sell-off and conservative forex traders may want to wait for a confirmation of the shift. A take profit target of 1.9000 has been selected for a potential profit of 790 pips. Forex traders should protect this trade with a stop loss level at 2.000 for a potential trading loss of 210 pips which will result in a Risk-Reward (RR) ratio of 3.76.